PC Pandora is a computer monitoring software that records all activity on a computer. What it can do? Record text based files, including instant messenger chats, emails sent and received, websites visited, peer-2-peer files shared, keystrokes logged, programs accessed, Internet search queries and more. Why we need this kind of software? It is good for parents who want monitor what kinds doing on internet; Boss wants monitor employee's behaviours in company. PC Pandora is a commercial software, it costs $70. Recently, PC Pandora launches a promotion for software. You have chance to get it for free between December 25 to 31. Just follow these steps below. Go to this Promotion Page, fill your email and name, click "submit" button. 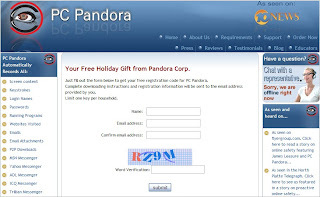 You will get an email that contains a register code for PC Pandora, and some steps for download link, install steps notes. After download software you can use that register code to active it.